Conor Shields is chief executive of the Community Arts Partnership. He leads a dedicated team of artists, managers, trainers and co-ordinators, providing advocacy programmes, information and training services and 10 separate community and schools-based arts projects across Northern Ireland. 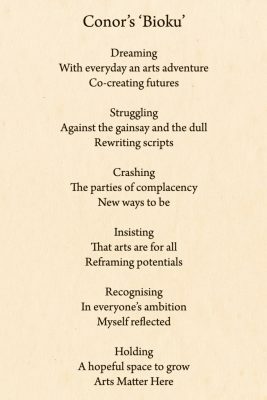 Conor is a multi-instrumentalist, a sometime poet and film maker and has worked with theatre companies, broadcast media and film, development education and community development agencies, and has facilitated workshops through a range of disciplines in theatres, community settings, schools and prisons. He has helped devise and lead a range of festivals, research projects and development programmes both at home and abroad. Along the way, he has studied Law, Politics and Voluntary Sector Business Management at London School of Economics, University of Ulster and Cass Business School London respectively. 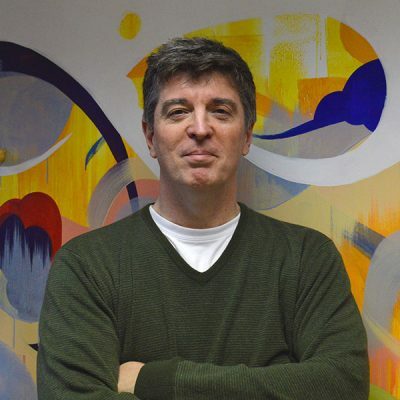 He is a ministerial appointment to the board of the Arts Council of Northern Ireland as well as the Ministerial Arts Advisory Forum and sits on both the Arts Council of Northern Ireland’s Intercultural Arts Steering and Community Arts Strategic Review Groups. He has co-chaired the Arts Policy Forum and the Northern Ireland Council for Voluntary Action (NICVA) Departmental Monitoring Group (Culture and Arts), is a founding director of Culture Night Belfast, sits on the board of the Cathedral Quarter Trust, having been a co-founder of the ‘Let’s Get It Right’ campaign, and is also a founding steering group member of the #ArtsMatterNI campaign group. Julianne was appointed as Development Manager in April 2015. Julianne holds a degree in History of Art, a Post Graduate Certificate in Higher and Further Education and a Post Graduate Certificate in Arts in the Community from Queen’s University Belfast. She has worked in the community, voluntary and statutory sectors in Northern Ireland for 17 years, working within project management and funding in the fields of community development, disability, education, play, Black and Minority Ethnic communities and of course the arts, where her heart lies. 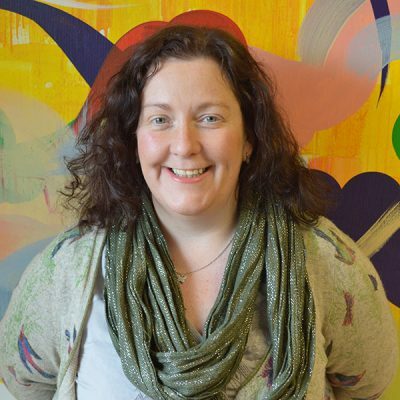 Julianne has been a Community Arts Officer for the Arts Council of Northern Ireland on two separate occasions and has worked on public art, festivals, art education in formal and informal settings and is passionate about using community arts for positive social change. She has been a non-executive director for several organisations including ArtsEkta, Cahoots Theatre Company NI and the Northern Ireland Visual Arts Forum. Gordon studied Politics and History at the University of New South Wales in Sydney Australia before arriving in Northern Ireland in 2001. 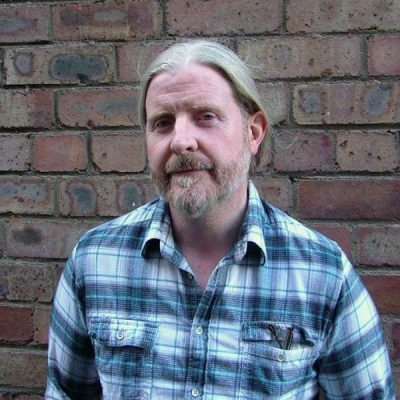 For many years he worked on various projects and in various roles with the Northern Ireland Anti Poverty Network before leaving to work freelance on event management, facilitation of creative writing workshops and workshops on multiculturalism. Gordon was the Director of Holywood Culture Night for the last two years..
As Information and Policy manager, he is responsible for production of the Community Arts Weekly bulletin (CAW) and the monthly funding bulletin, CASH. 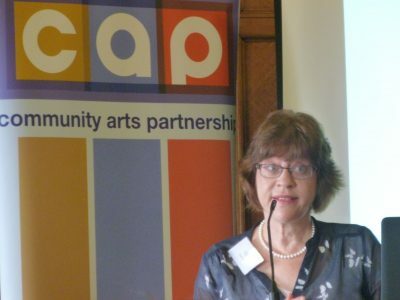 There is a wider responsibility for generating and maintaining information regarding CAP’s many community arts projects as well as ensuring CAP’s contributions to policy development in the sector and CAP’s advocacy for community arts is maintained. Gordon has a writing and performance background and has toured regularly with spoken word and musical groups. Heather has been working on Trash Fashion since 2004, first as a facilitator and then as Project Co-ordinator from 2008. Heather has a natural creative ability for Fashion Design. She designs dance costumes, carnival costumes, bespoken outfits and has worked on a wide range of alterations. As a former Boutique owner she has an extensive knowledge of Fashion Retail including stock control, merchandising, and visual display. Heather has also co-ordinated Fashion Shows for Cancer Research, Church of Ireland and local community fundraisers. She has facilitated workshops for Craigavon Borough Council, Belfast City Council and the Shankill Festival. Heather facilitated three Shankill Festivals for St. Matthews Mother & Toddlers, each time gaining the overall Festival Trophy. She was also Chairperson for this Mother & Toddlers group for 8 years. Heather has been trained in Disability Awareness, Conflict and Mediation, Care in the Family and Child Protection. With excellent interpersonal skills, Heather enjoys working as part of a team and thrives on the achievements of others. Sally graduated from the University of Ulster in 1991 with Ba (hons) in Fine Craft Design, and in 1995 with Msc Women’s Studies, as well as obtaining a Certificate in Community Development with Queen’s University. She has been based in Queen Street Studios, Belfast, since 1991 as a practising professional visual artist and working as an artist in the community since the early 1990s. Her work as a freelance community artist has given her the opportunity to engage with people from a variety of backgrounds and ages, from early years to those from an older generation. She has worked solo and in collaboration with other artists and art forms, had various projects commissioned and worked in residence in many different settings. Since 2000 she has been employed as a project coordinator for Community Arts Partnership, managing and facilitating a range of performance, visual arts and carnival arts based projects throughout Belfast. 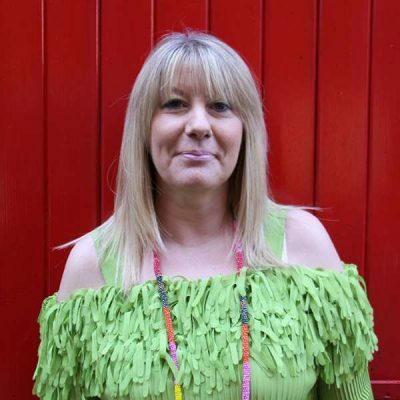 This, combined with her work with the Beat Initiative carnival company amongst many other arts and voluntary sector community organisations, has enabled her to work within a community setting over a period of 20 years. More recently she has also been involved in delivering professional development training for a range of arts and community. 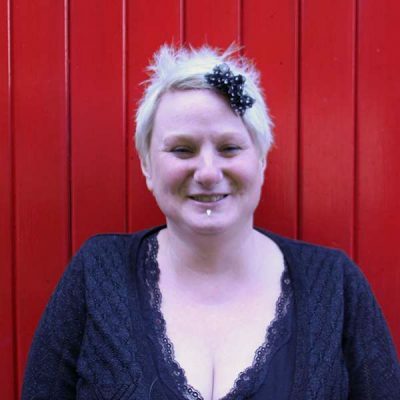 Joanne was appointed project coordinator for This is Me in November 2011. A graduate in media studies at University of Ulster, she also has an OCN in youth work. Joanne has previous experience of setting up her own local production company ‘Slingshot creations’ in which she has directed, produced and edited on a vast range of video productions. She has an awareness of contemporary methods of production and design and an ability to use varied digital multi media equipment. She has worked with BNL productions with a range of participants including young people in interface areas developing short films. She has also worked alongside Big Telly Productions producing promotional videos. 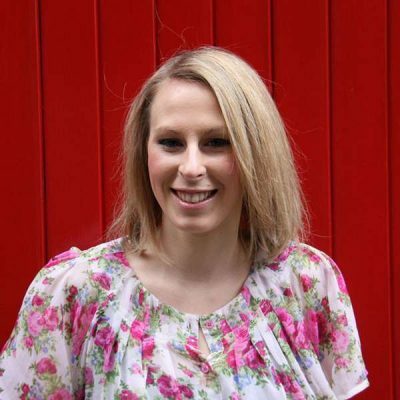 She has extensive experience in working with community groups on media/arts based projects. Charo grew up in South America, in her home country of Peru. 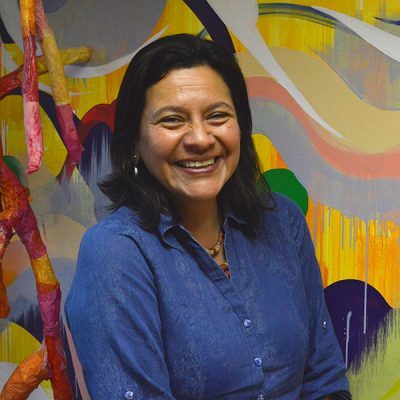 In Peru, she worked for different organizations that work on issues of Fair Trade, Gender and Development and Management of Natural Resources. Charo is an experienced trainer and facilitator on antidiscrimination, antiracism and diversity. She was deeply involved in the development of the Latin American Association and was the coordinator from 2003 to 2005. From 2005 to 2007 worked for Community Change as a training and development officer providing training on governance and strategic planning for community groups. On 2008 she worked for Rural Community Network as the Good Relations Officer. Also she has been involved developing training modules and research on racism and migrant workers for ANIMATE and STEP. 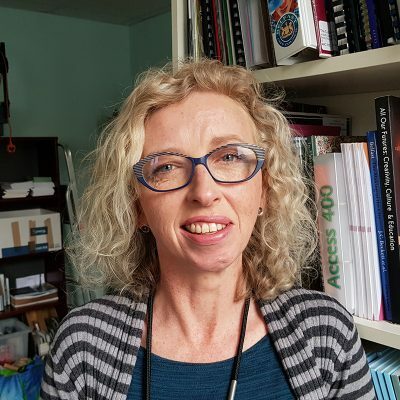 Since September 08, she works for the Centre for Global Education as the coordinator for the “Making Connections Project” a global education project for the ethnic minority sector in Northern Ireland. Currently she is also a Commissioner for the Equality Commission in Northern and she is involved with the Black and Minority Ethnic Network. She has a BSc in Sociology, a M.A. in Conservation and Development, Post Graduate Diplomas in Gender Studies, Community Drama Facilitation and recently obtained her accreditation as an NLP practitioner. 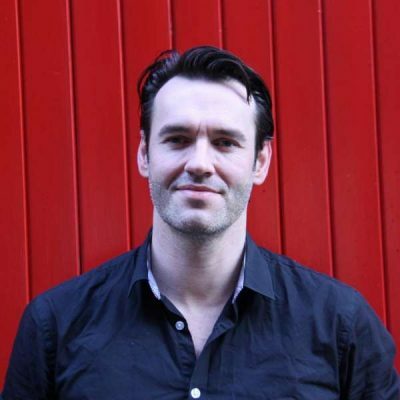 For the past ten years Steven has freelanced in Belfast and further afield, as an artist, graphic and web designer. 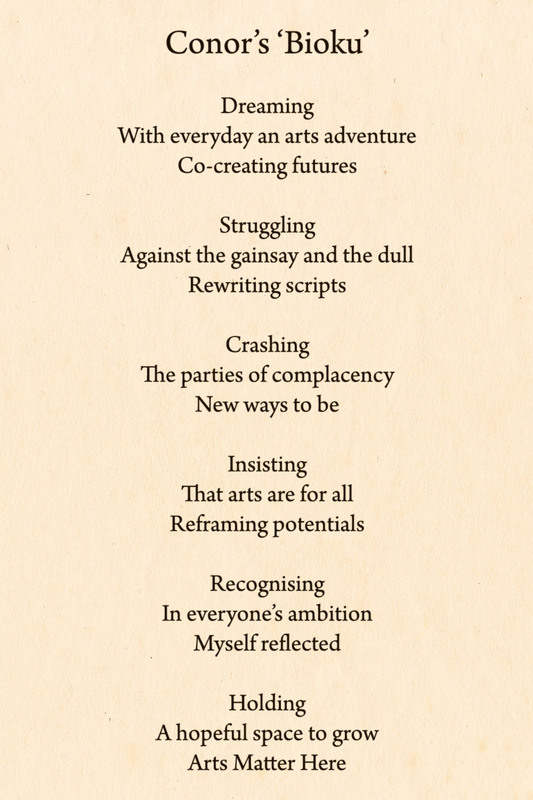 He has worked as a community artist on a variety of small to large scale arts projects in Greater Belfast. Steven has worked for New Belfast / Community Arts Partnership since 2005. He has been responsible for IT support, the design of brochures and other publications, as well as creating the organisation’s web sites. He has also worked as sound technician and audio editor on many of the Poetry in Motion projects working with adults and children from across the city.